Native viburnums and their fancier horticulturally developed cousins thrive in the southeastern Piedmont. The natives all have similar flat-topped flower clusters (cymes) of white to yellowish-white flowers. The fruits look like clusters of berries (drupes, botanically speaking). In the case of Mapleleaf Viburnum (Viburnum acerifolium), the fruits are usually nearly black when fully ripe. The birds will eat these fruits, but they wait until late winter, when preferred food sources are gone. I like this native deciduous shrub for several reasons. First, it tolerates deep shade and dry soils, which means it can handle forest hilltop conditions. Second, its flowers illuminate the forest as the canopy leafs out above it, and third, the fall color is unique and very pretty. The leaves turn shades of pinkish lavender-purple — very eye-catching. No native viburnums were growing on our property when we moved in, but we’ve added quite a few over the 22 years we’ve been here. I finally added a Mapleleaf Viburnum three years ago. It’s flourishing beneath the dense shade of a Water Oak on the dry hilltop of the north-facing side of our yard — inside the deer fence, so it’s not getting nibbled. This shrub is stoloniferous, which means it will spread via underground roots to create thickets of itself. Beneath the shade of my Water Oak, where not even weeds grow, this shrub has my permission to spread itself around, thereby anchoring the soil, and eventually creating quite an impact with its annual fall display of color. It tends to grow to no more than six feet high, and a typical shrub will be four feet wide at maturity. 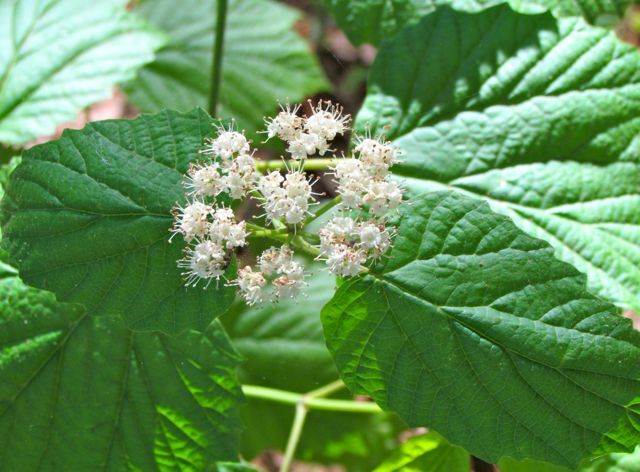 Like many of our native shrubs, it has some other common names, including Mapleleaf Arrowwood, probably because of its resemblance to the Arrowwood I told you about here. 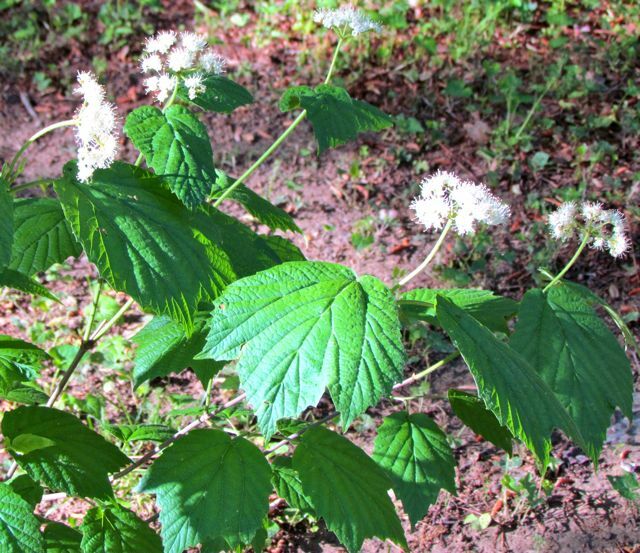 Whatever name you use, if you’ve got dry shade and you like unique fall color, consider adding Mapleleaf Viburnum to your landscape. This entry was posted on May 2, 2011, 7:54 am and is filed under Favorite Plants, piedmont gardening. You can follow any responses to this entry through RSS 2.0. You can leave a response, or trackback from your own site. Lyreleaf Sage: Lovely Wildflower Groundcover -- With Blooms!